Happy, sweet, and floral—just one spritz of this beautiful room spray brings the refreshing and mood-lifting fragrance of lily of the valley into your home. Aside from its fascinating history and captivating fragrance, lily of the valley offers a number of perceived health benefits. This prized fragrance is known to aid relaxation, imbue calmness, and help to restore inner peace. Bring this intoxicating floral fragrance to your home with the purest of essential oils, captured in a convenient room spray that disperses a heavenly, lingering scent in every room. Unlike other so-called ‘air fresheners’, our natural room sprays are made without chemicals or toxins that can be harmful to your family’s health. 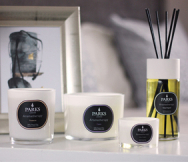 Our Lily of the Valley Room Spray comes in a smart clear and black bottle featuring the Parks iconic branding. The bottle is presented in a sleek white luxury carton with a smart black trim, making the ultimate stylish gift.